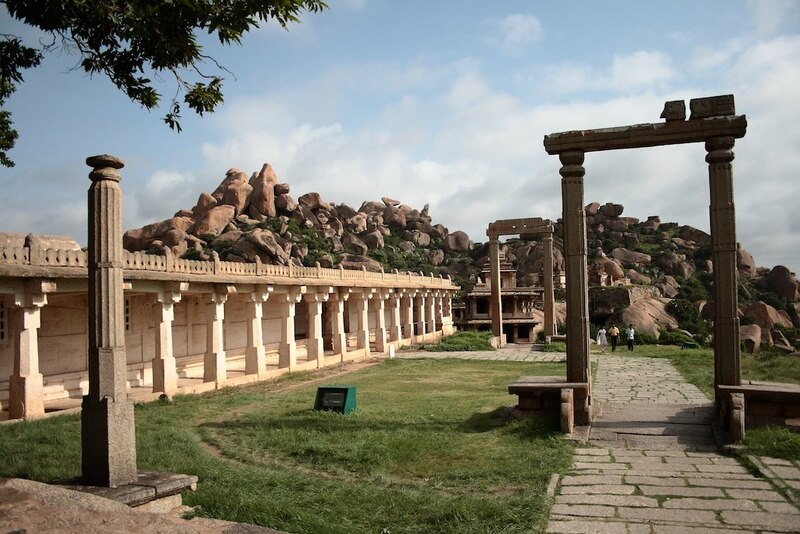 Chitradurga is around 130kms from Bellary and 200kms from Bangalore. Roads are great and driving time from Bellary was around 2.5 hours. We spotted a nice big hotel right next to the highway and checked in to it. I don't remember the name of the hotel, but I guess it was Hotel Green Park or something. The hotel had a nice restaurant where we had dinner. The fort is around 20kms from where the hotel is, the road passing through the city. It is a well known tourist place and popular among local crowd and all kinds of tourists. It can get really crowded at the fort and parking space in front of the fort is scarce. In spite of reaching the gates quite early (around 10 AM) the parking spaces were almost full and we were lucky to find a usable space we could squeeze our car into. One has to purchase tickets to enter into the fort and there are plenty of guides available whom one can hire to show you around. The fort is pretty vast and has many small monuments that have interesting stories. They are useful if you don't know the place and care about the anecdotes. We hired one. 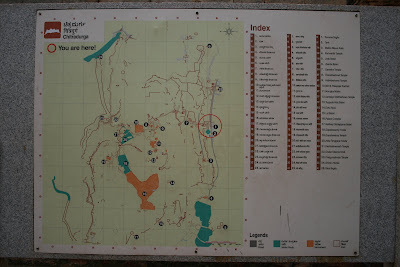 There's a nice map at the entrance which one can refer to get a general idea of what is where inside the fort. 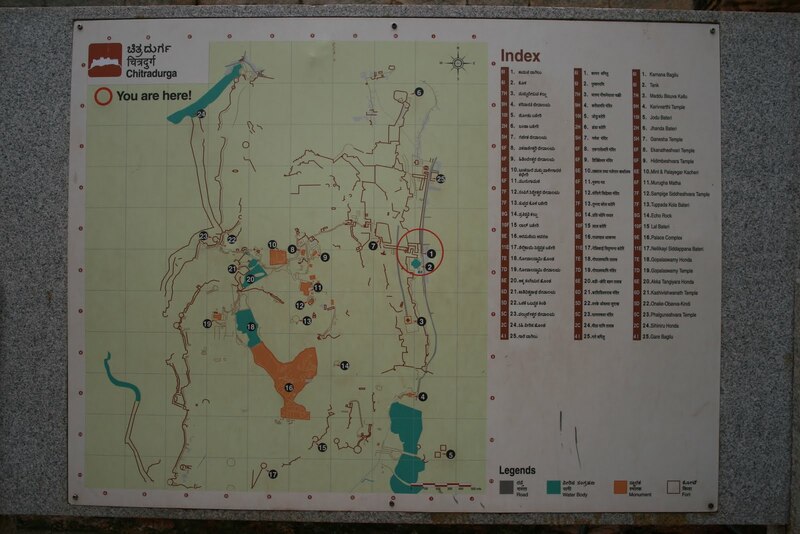 Below is a picture of the map. Click on it to enlarge and print it as a reference if you are visiting. 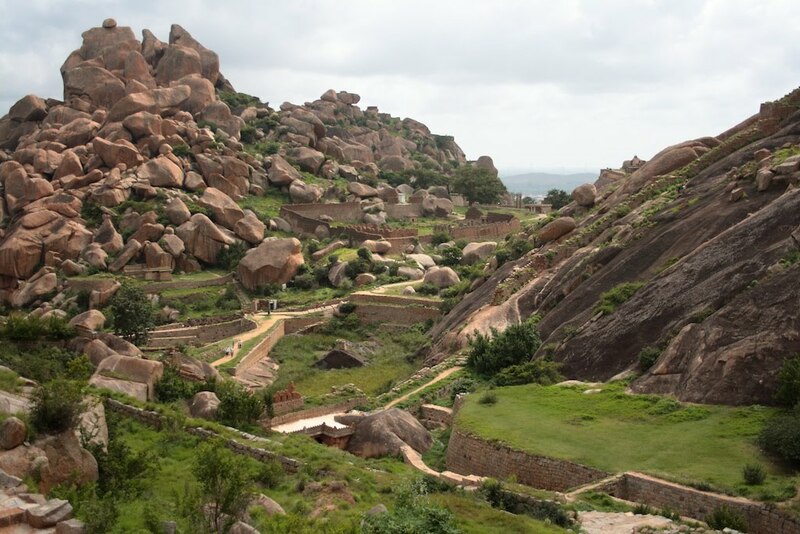 Chitradurga is really vast and true to its name, picturesque. 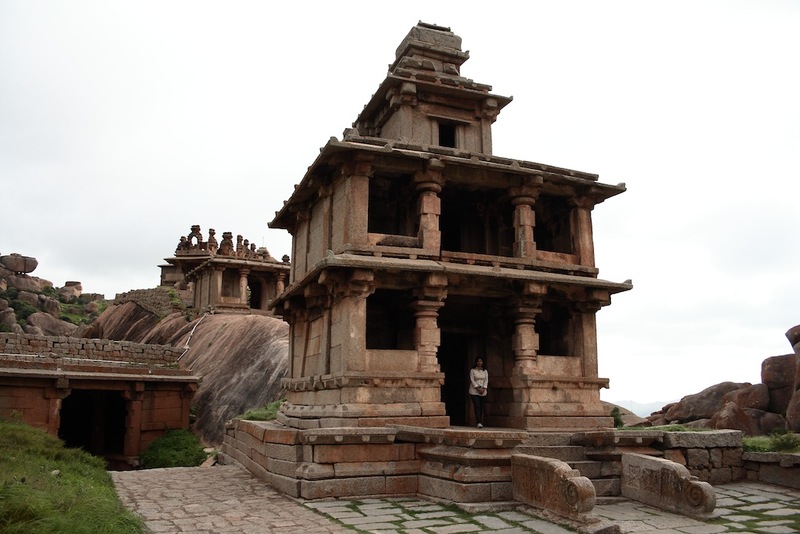 Its history dates back to the Chalukya era (6th century AD), but it achieved most of its prominence in the era of the Vijayanagara empire (1500 - 1800 AD). The Nayakas, feudal lords of Chitradurga, were associated with the Vijayanagara empire till it crumbled around 1565 AD. After that this area was ruled independently by the Nayakas till 1780 when Hyder Ali seized control from the Nayakas. Hyder Ali and subsequently Tipu Sultan strengthened the fort considerably. After Tipu Sultan's death in 1799, the British rulers used the fort till they left. 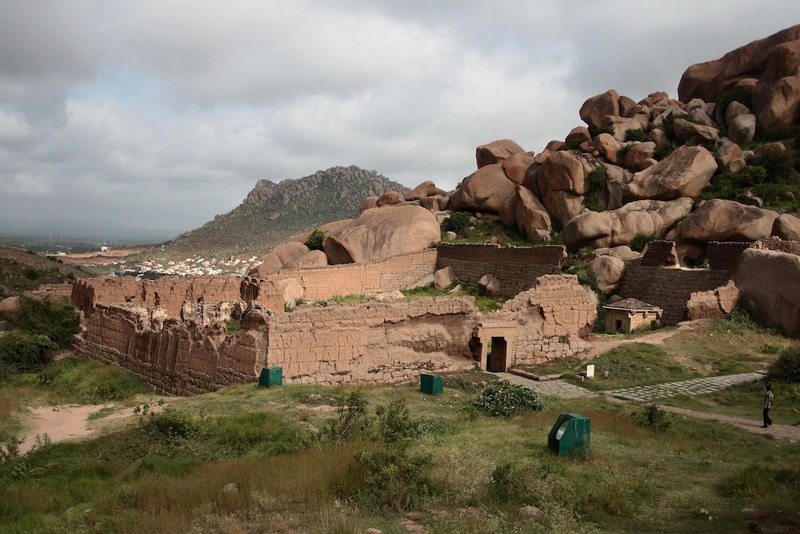 Below is a series of pictures of Chitradurga. Most of the structures standing today are temples and a few important constructions that were built with stone. There were many structures built with mud which have been destroyed completely. Few mud structures standing till now are parts of the palace and official structures (e.g. mint, treasury). What is striking is the greenery inside the fort - unlike all other places that we have seen so far. This place must be really fertile! 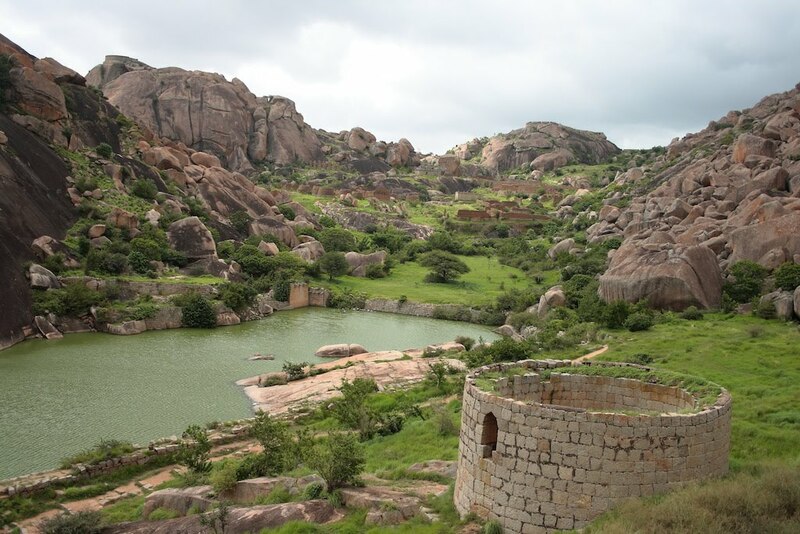 Beauty and greenery of Chitradurga Fort. Mint and Treasury complex (left). 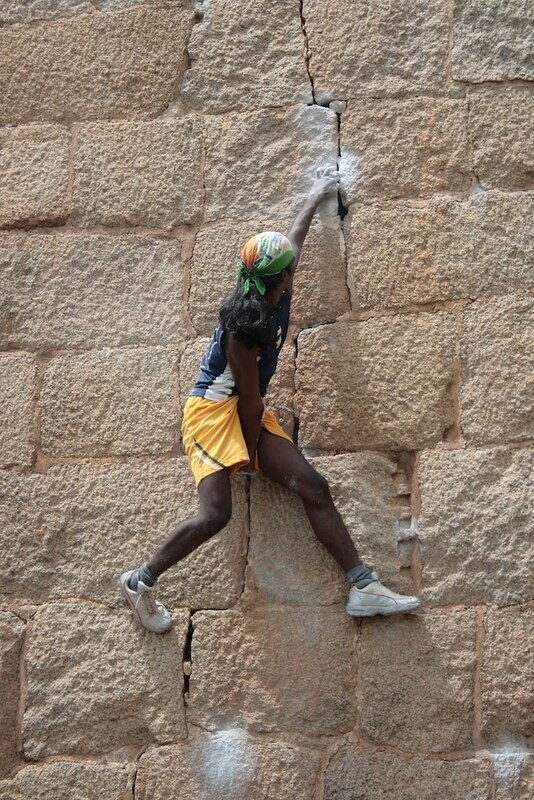 Another event not to miss while at Chitradurga fort is the show by the local "Spiderman"! His real name is Jyothi Raju and he is amazing with his climbing skills. He put up a nice show while we were there. His well rehearsed climbs, jumps and even slips are amazing to watch. The internet is full of videos of him. Chitradurga Spiderman - Mr. Jyothu Raju. The guides usually rush you through the prominent places in a couple of hours. But one can spend the whole day inside the fort. The guides charge around 300-400 rupees, but it probably also depends on your bargaining skills. After letting the guide do his job, just walk around slowly revisiting the places you saw or sit quietly under the shade of a tree or a temple courtyard. Carry enough food inside, there are no shops inside and hawkers are not allowed inside. Thus ended our day at Chitradurga and this whole North Karnataka road trip. It was a long trip full of awe inspiring stories, monuments and sights. It was simultaneously enjoyable, relaxing and educative. Do comment and let me know how you found this series of posts titled "A Trip Down Memory Lane" covering a historical circuit around North Karnataka. ^ our visit to this place.